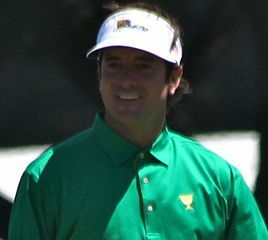 Bubba Watson, the winner of golf's 2012 Masters, has been speaking to Fox News about his family and his faith. The 33-year-old left hander beat South Africa's Louis Oosthuizen in a play-off on Easter Sunday, helped by an amazing shot out of the trees on the 10th hole, leaving him eight feet from the pin. They started the process of adopting four years and two weeks ago, they completed the adoption of Caleb.